Bristol is not short of food options and actually holds a big reputation when it comes down to the diverse range of vibrant and tasty foods on offer in the city. 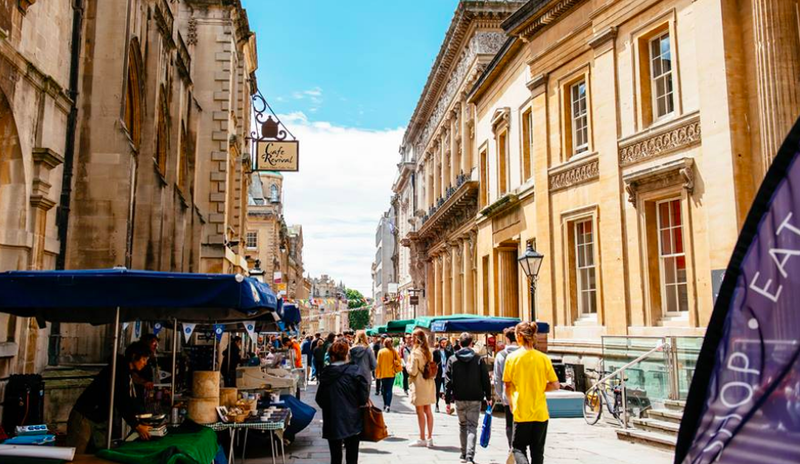 The city centre boasts top-end restaurants that are sure to satisfy your taste buds, whereas if you step just a little bit outside of the centre you can find some glorious and diverse options. Head to St. Pauls (made famous for previously being home to one of the biggest and best street parties in Europe) to try out some of the best Caribbean restaurants in Bristol - all independent and authentic, of course. For a true tasty Bristol experience head to Bearritos in the Bear Pit to enjoy some Mexican food (be sure to try the burrito) in a vintage double decker bus. Bristol is big on street food and there is no better place to go than St. Nicks Market - a colourful and vibrant indoor market set in a Georgian arcade that offers food stalls and independent stalls and shops. On the weekends, stalls spread out onto the streets to offer a range of delicious foods and items. 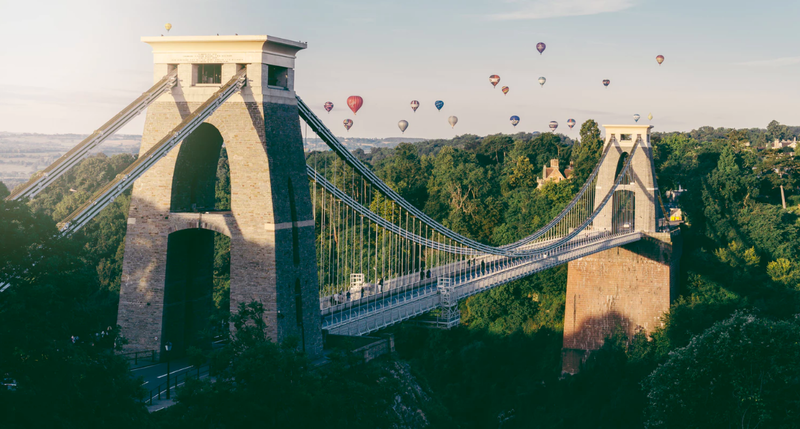 If a coffee in a cosy snug cafe is all that you are after, then Clifton is the place to go - Bristol's most quaint and architecturally beautiful area. Whatever you're after, you won't be stuck for choice. Bristol is big on vintage apparel and probably one of the best places to pick up some real second-hand gems. As mentioned above, Bristol's Gloucester Road is home to the UK's largest stretch of independent shops - ranging from small bohemian shops to charity and nutrition shops. This is one of the best places to go charity shopping in Bristol as the long Gloucester Road is packed full of them. Clifton Village is a great place to go if you want to pick up some unique antiques and you can find the infamous Bristol vintage shops dotted pretty much all around the city - selling old designer items, records, fur coats and the vintage shell and track jackets that you see most uni girls wearing in the city. World-famous artist Banksy was once just a kid in Bristol who (like all the other kids in Bristol) enjoyed spraying art onto the many walls of the city. Now, many people flock to Bristol to see his earliest pieces of work that are hidden and dotted around the city. Walking around the city and spotting Banksy's work makes for a great day out - particularly as there are many food and drink stops along the way. Some good ones to look out for are: The Girl With The Pierced Eardrum (central Bristol - near Bristol marina), Well Hung Lover (Frogmore Street - on the side of a clinic) and The Mild Mild West (situated next to The Canteen in Stokes Croft). For a longer list of his work around Bristol, click here. Bristol is notorious for its vibrant music scene - and there really is something for everyone. Underground live gigs, open mic nights, speakeasies, bustling bars, gritty nightclubs, comedy nights, drunk bowling, theatres, intimate music sessions, spoken word, poppy clubs and karaoke bars... consider yourself catered for. Popular venues that are worth a visit to include: Motion (voted the 19th best nightclub in the world and set in a matrix of old warehouse spaces), The Apple (a bar on a boat that spreads out onto the ground - try Bristol's best ciders here) and The Full Moon (the building itself is painted like a starry galaxy - it's quite something to see! The Full Moon is also home to one of Bristol's best beer gardens). For more nightlife click here. One thing that Bristol is particularly popular for is the beautiful countryside - and you really don't have to stray too far to reach it. The Downs, situated in Clifton and on the edge of the city, is a huge protected parkland full of green grass and trees for as far as the eye can see. It is the perfect place to take a picnic, to walk your dog on, to kick a football around on or to just have a walk around and get some fresh air. Walk to the edge and you can you can see beautiful views of Bristol, including the Clifton Suspension Bridge. Alternatively, you can stray a little bit further out of the city and head to Ashton Court Estate - a beautiful stretch of woodland (850 acres to be exact) that features a beautiful mansion too (the perfect place to pick up a coffee before setting off on your walk). You can often watch deer roaming the fields. Bristol was the first ever city in the UK to win the European Green Capital award. The city as a whole is super passionate and enthusiastic for all things green and sustainable and aim to look after their environment. Bristol was one of the first cycling cities in the UK! It is a small city. Pretty much everywhere in Bristol is within walking distance (and if not, there are busses all the time). It's not like London where it can take up to an hour to get somewhere very close. The population of Bristol is around 449, 300 people. Bristol has a harbour side and it is right in the city centre, with lots of bustling restaurants and bars dotted down the sides of it - it's pretty, atmospheric and makes a lovely walking break from shopping in the centre. Have you ever visited Bristol? You post is really comprehensive...we have not visited Bristol yet but will definitely use your post as a guide when we do. I have never been to Bristol, well not that I can remember it sure looks a fab place to visit lots to see and do. Bristol is somewhere I have never been, but definitely intrigues me, I would love the independent shopping and hey who wouldn't fancy going Banksy spotting! Bristol is my absolute favourite city, I love Gloucester Road for shopping, wandering down the harbourside, everything. It's a beautiful place. Bristol looks like an amazing place to visit and yet I've never been! I would love to explore the Banksy art and the Ashton Court Estate would be great to have a run around! We've never been to Bristol but heard off friends that the shopping is amazing! Never knew they had so many independent shops! I have never been to Bristol before but I am sure I would enjoy it, especially the street food and burritos! I've never been to Bristol and to be honest, didn't know much about it but I love shopping at independent shops so it's definitely on my list now. Never been to Bristol although my mum and dad have and they love it. It does look nice. Can you believe that I have never been to Bristol. It's on our (very big) list of places to visit this year.